The REBOX Cabinets are specifically designed for housing remote and network equipment. REBOX cabinets exceed the stringent requirements of UL and Telcordia enclosure standards. The resulting safe and secure envrionment surpasses the industry for protecting communications equipment in locations such as classrooms, warehouses, and retail outlets. Use the pre-configured REBOX as a small remote data center. Each cabinet includes dedicated mounting for hubs and other active equipment and another dedicated mounting area for patch panels. Use the unloaded REBOX in applications such as horizontal cross connects or the telecommunications room. The modular design of this cabinet is very versatile, allowing the installer to configure the cabinet with a wide variety of accessories to mount any type of components. Cable entry knockouts for conduit sizes from 1/2" to 1.5"
16 guage equipment cabinet specifically designed for housing remote and network equipment. 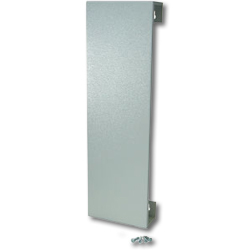 Includes dedicated mounting for hubs and other active equipment as well as dedicated mounting area for patch panels. 16 guage equipment cabinet specifically designed for housing remote and network equipment. Use for horizontal cross connects or small telecommunications rooms. The unloaded REBOX can be configured to accept wall mount, rack mount connecting hardware and active equipment. The mounting rails are not included, providing for flexibility to configure your requirments. Click here to view Hubbell's REBOX Remote Equipment Cabinet PDF.